One Reckless Summer hit the USA Today bestseller list! What a wild ride this summer has been for Toni! In June, Barnes and Noble named her their Spotlight Author, which resulted in her first Destiny book, One Reckless Summer, climbing to #2 on the Nook rankings just behind Dan Brown's latest. It stayed in the top five for over a week, then hit the USA Today bestseller list—four years after it first came out! Toni was totally stunned and completely thrilled. Thanks to the book's newfound success and the great reviews for Half Moon Hill, new readers are falling in love with Destiny—and Toni could not be more grateful to everyone who has read and shared their love of her books. This summer, Toni has gotten to reconnect and visit with lots of friends. 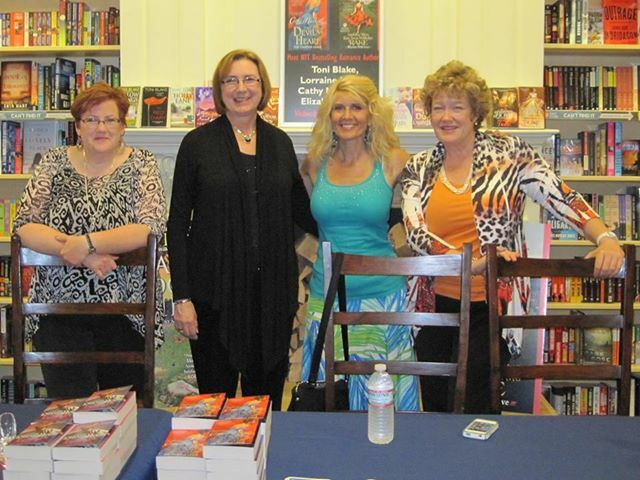 She was delighted to welcome fellow Avon authors Cathy Maxwell, Elizabeth Boyle, and Lorraine Heath to the greater Cincinnati area for a signing at one of Toni's favorite bookstores, Joseph-Beth Booksellers in Crestview Hills, KY. When they weren't signing books, they took some time out to play: Toni took them on a quick tour of Cincinnati and out for a fun dinner. Only a couple of weeks later, Toni's dear friend, author Lori Armstrong/Lorelei James came to stay with Toni – but they didn’t stay home! Among their stops was the famous (or infamous?) town of Rabbit Hash, Kentucky--where the locals routinely elect a dog for mayor. But Lori didn't just come to play with Toni. Together, they met readers and signed books at one of Toni's favorite annual events--the Reader & Author Get Together sponsored by Lori Foster. Even though the Get Together has blossomed from 50 attendees to over 500 in the last eight years, Toni still finds it warm, friendly, and a great time and place to catch up with friends and fans. 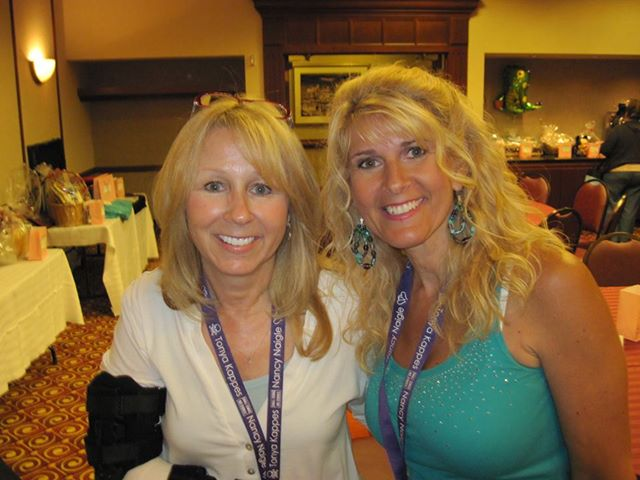 Lori Foster pulled off the event with her usual grace--even though she had a broken arm! When she’s not working or visiting with friends, Toni has been enjoying some home decorating and landscaping. Check out her daisies, which remind her of Whisper Falls. To get an idea of what Toni’s personal style and decorating inspirations are, join her on Instagram and Pinterest. For readers who like to get in touch by postal mail, her new address is P.O. Box 1053, Union, KY 41091. If you stick a SASE in your envelope, you just might find some Toni Blake bookmarks in your mailbox one day! Toni's updated her digital home as well. Her website has a new host and a new look, so stop by and let her know what you think. She loves hearing from readers in person, by mail, by email and on Facebook. She reads all of her comments and responds as often as she can. The biggest event of Toni’s summer is almost upon her: The annual conference of the Romance Writers of America (RWA). Thousands of writers, readers, and publishing professionals will converge on Atlanta, Georgia next week for workshops, meetings, awards ceremonies…and parties! If you’re in the greater Atlanta area, you can attend the HUGE RWA booksigning, open to the public, and meet Toni and hundreds of other fabulous authors. Join them all at the Atlanta Marriott on Wednesday July 17 from 5:30 to 7:30 PM. For a more intimate signing, you can also meet up with Toni at the Eagle Eye Bookstore in Decatur, Georgia on Saturday July 20, from 2 to 3:30 PM. As busy as she has been, Toni’s been working feverishly on her next book, Coral Cove. Avon artists have already shared the beautiful cover art with herand Toni looks forward to sharing a sneak peek of the artwork with her readers soon. Also coming soon on Facebook and at www.toniblake.com: the gorgeous cover for Wildest Dreams, which comes out this December. But in the meantime, if you love having great narrators read you great stories, you can get Half Moon Hill on audiobook – the audio version just became available on July 10. Take Me All the Way is Now Available! Love Me If You Dare is Available Now! First Look! Love Me If You Dare!